Shell UK Exploration and Production (Shell Expro) is using Yokogawa's FOUNDATION Fieldbus technology to reduce operating costs and upgrade the control systems on Brent Alpha, a first generation platform that has been producing oil and gas from the North Sea's Brent Field* since 1978. This is an extremely cost effective and reliable solution with low life cycle costs and high total value of ownership, and it has added years to the Brent Alpha platform's life. A key aspect of this major undertaking has been the conversion of operations at Brent Alpha so that this platform can be managed from a remote location, thereby significantly reducing its operating costs. Brent Alpha's control and safety shutdown systems have been replaced and its hydrocarbon processing and power generating equipment will be decommissioned at a later date. Brent Alpha now operates as a satellite operation of Brent Bravo, which is located just three kilometers away. A number of wells on Brent Alpha feed the Brent Bravo platform through a new subsea pipeline (multiphase tieback), enabling hydrocarbon processing to be carried out on Brent Bravo. Under normal operating conditions, the Brent Alpha control room is unmanned and operated in "lighthouse mode" from Brent Bravo. There, the control room is manned around the clock and has the primary responsibility for monitoring and controlling the wells and hydrocarbon fluids coming over from Brent Alpha. The solution for achieving the required operational cost reduction was to use a system that could be relied upon not only to provide continuous, safe, and efficient operation but also to report anything falling outside established parameters to the adjacent Brent Bravo platform. Unmanned operation of a platform places stringent demands on the availability of a control system. Shell has selected FOUNDATION Fieldbus** as its solution because this technology provides the environment for ongoing cost reductions and is able to incorporate future technology advances that will further reduce operational costs on the Brent Alpha platform. With Foundation Fieldbus technology in place, Shell is using Plant Resource Manager (PRM), Yokogawa's real-time plant resource management tool, to manage all instrumentation calibration, device diagnostics, and maintenance records on the Brent Alpha platform. This is expected to minimize the total cost of ownership (TCO) and maximize the total value of ownership (TVO) over the life cycle of the Brent Alpha platform. The core of Brent Alpha's new control and safety system is the Yokogawa CENTUM CS 3000 Integrated Production Control system. 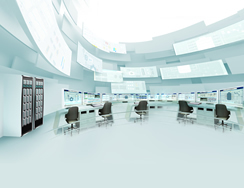 Yokogawa's CS 3000 represents a new era in distributed control systems (DCS), integrating the high reliability of its predecessors with an open environment that facilitates integration with enterprise resource planning and manufacturing execution systems. This simplifies the task of constructing a strategic management information system and makes this a truly cost effective solution. Yokogawa's ProSafe-SLS safety system is in use at more than 70 Shell installations throughout the UK, and on the Brent Alpha platform it is used to provide both emergency shutdown (ESD) and fire & gas systems. ProSafe-SLS compliments the DCS, providing a complete control and safety system that can react to emergency events in one millisecond. All safety related events are journaled with time stamps and stored in chronological order in the CS 3000. 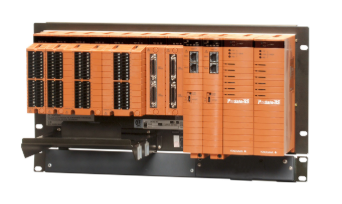 The Brent Bravo ESD system also uses a Yokogawa ProSafe-SLS, and it was modified to accept inputs via a dedicated link to the Brent Alpha platform that enables a total platform shutdown procedure to be carried out in the event of an emergency. An important consideration in the cost reduction program for the Brent Alpha was the need to minimize the amount of time that the platform would have to shut down for the redevelopment work. To meet a two-week deadline for the commissioning of the complete control and safety system, parts of the system were installed and commissioned before the shutdown. This prestaging of the system including all FOUNDATION Fieldbus devices ensured that no equipment would be installed on the platform without it first being tested in the format in which it would be used in the offshore installation. Shell is leading the way with this first Fieldbus installation in the North Sea's UK sector. Introduction of Yokogawa's FOUNDATION Fieldbus and plant resource management technology are enabling Shell to significantly reduce routine daily operating costs and improve asset management. * Operated by Shell Expro on behalf of Shell/Esso, the Brent field is Britain's largest oil and gas field, with an estimated ultimate recovery of approximately 3.194 billion barrels of oil equivalent and 4.3 trillion cubic feet of sales gas. It lies186 kilometers northeast of Lerwick, Shetland, and the water depth at this location is 140 meters. Oil was first discovered here in 1971 and production began in 1976. In 1982, the Far North Liquids and Associated Gas System (FLAGS) pipeline to St Fergus was completed and gas production was initiated. ** Developed by the Fieldbus Foundation, FOUNDATION Fieldbus technology provides a two-way, multi-drop communications link between intelligent measurement and control devices. Yokogawa is a strong contributor to the Fieldbus Foundation and supplies a wide range of field devices along with the Plant Resource Management tool and a fully redundant operator interface to the CENTUM CS 3000.